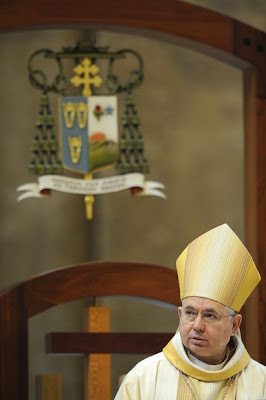 Precisely eleven months since the Appointment of the Century came to pass, the lengthiest transition of a major post on these shores in 130 years reached its end today in the nation's largest local church, as Archbishop José Gomez of Los Angeles finally had the chair and the cathedral all to himself for his first Sunday Masses at the helm of the 5 million-member LA fold. Having taken the reins and made his first symbolic moves, the work of leading the global church's sixth-largest diocese now begins in earnest for the 59 year-old prelate. But as he started in, the Mexican-born cleric who'll eventually become the Stateside church's first Hispanic cardinal couldn't help but be upbeat. What's more, though, while B16's most game-changing American pick might take his formal motto from Paul's letter to the Hebrews (4:16) -- "Let us go forth with confidence to the throne of grace" -- what's seemingly become the archbishop's unofficial tagline in his new post notably appeared anew today: Gomez's resounding plea "that no one [be] a stranger to any of us." Maintaining his predecessor's preaching-spot at the cathedra -- but seeming to prefer a music stand and paper to Cardinal Roger Mahony's famous, impeccably-concealed teleprompter -- here below is Gomez's text from this morning, his first formal homily as Los Angeles' fifth archbishop. This is amazing! Just last Sunday we celebrated the 25 years of ministry and the retirement of Cardinal Mahony with a beautiful Eucharistic celebration and today we gather again around the altar of the Eucharist as the family of God to begin this new time of grace for me personally and for the Archdiocese of Los Angeles. As I said before, this is not a future I could have ever imagined for myself. But our God is a God of surprises—un Dios de sorpresas—as well as a God of blessings and tender mercies! As I mark the start of my ministry today in this celebration of the holy Eucharist, I thank our good God for the awesome privilege of being able to serve you. I ask you to please pray for me. Pray that our God will give me courage, strength and wisdom to continue to strive for holiness. 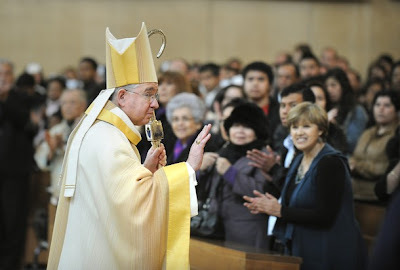 Ask him to make me worthy of this beautiful task of serving the family of God in this great Archdiocese of Los Angeles. The readings today from the Word of God are all about Catholic identity and Christian mission. They are about who God made us to be, and what he wants us to do. We are Catholics, my friends! That means our lives are not our own. I feel that more and more as time goes on. No matter where we come from, no matter what we do for a job — we belong to Jesus, who loved us and gave his life for us. We belong to his family, the Church. And we belong to one another, as Christ’s sisters and brothers. We have to learn to see our lives with the eyes of Christ. In his eyes, each of us is here for a reason. Each of us is called by God. He calls us by name, like a Father calls his beloved children. God knows your name. God knows my name. Every time I think about this, my friends, I can’t help it: I am amazed. Think about what that means! The God who created the sun and the moon, the stars and all the earth, wanted me to be born. Ever since the world began, this God wanted you to be born. That’s the Gospel, my friends. That good news should totally change our lives! To know how much our Father loves us. To know that he gave his only Son so that we could live forever with him as his sons and daughters! This is the good news that he commands his Church to proclaim to the ends of the earth. Sisters and brothers, that’s why we are here. Because our Father loves us as his children. Because he has something special that he wants each of us to accomplish for him. What our Father wants from you is different from what he wants from me. God has called me to be a priest first and now to this chair to be your Archbishop. But God gives each of us unique responsibilities as co-workers in his loving plan for the salvation of the world and the redemption of history. That’s what these readings are all about today — hearing the Word of God, taking it to heart, and then doing the will of God. We are beloved children of God! Children entrusted with carrying on the mission of God’s only Son. The readings today are meant to motivate all of us to prayer and action. They are intended to make our hearts burn with a desire to be holy, missionary people — the people that God wants us to be. Yet I hear these words today addressed in a special way to me, as I begin my ministry among you. I have to say that I don’t really see it as my ministry. I hope that I will be a “conduit,” an “instrument” of the ministry of Jesus Christ and his apostles. I want to build my ministry on the foundation of God’s Word and commandments, as Moses says in today’s first reading. I want to build as Jesus says today: on the solid rock of the Church — that has Christ as its cornerstone, and the faith of St. Peter and the apostles as its foundation. Every bishop is a link in a great spiritual chain that extends back to the apostles. So I’m not here to implement my own ideas. I am here to try to be an apostle of Jesus Christ and a witness to his Resurrection. I’m here, together with my brother Bishops, to lead and sanctify and to proclaim to the men and women of our day that Christ is risen, that God is alive! We are living in a time when the awareness of God is fading away. More and more people are living in indifference, with no religion at all. Our society increasingly encourages a kind of practical atheism in which people go about their daily lives as if God does not exist. This is a false path, my friends. It can’t lead to true freedom or happiness. We can see this all around us in our society. Indifference to God leads to indifference to the needs of the weak and vulnerable. When we don’t believe we have a Father in heaven, we find it harder to live as brothers and sisters here on earth. Our world needs a new evangelization! We need a new mission to the American continent! We need to bring the beauty of the Gospel to the people of our time. This is our task as the Church of Los Angeles! St. Paul reminds us in today’s second reading that we are sinners. That all of us fall short of the glory of God. That’s true. And it should keep us humble. But we also have a great dignity and responsibility as Christians. Jesus shared in our flesh and blood so that we might share in his flesh and blood. He shared in our humanity so that we might share in his divinity. If this mission were ours alone, it would be impossible. But with God all things are possible for the ones who believe. So let us believe in his Word, my friends! Let us live with the intensity and confidence of the first Christians. And let us do everything for God! I don’t usually preach this long. It’s true. Come back next Sunday, I promise it will be shorter! But before I stop, I want to invoke Ven. Maria Luisa Josefa de la Peña, the refugee from Mexico who founded our Carmelite Sisters of the Most Sacred Heart of Los Angeles. A good friend told me about Mother Luisita before the Mass of reception last May. She has had a special place in my devotion since then. She has a great story. She was born in Jalisco and she married a doctor. She spent many years with him serving the poor in a hospital they built in Atotonilco. When he died, she entered religious life and continued serving the poor. She founded a school and an orphanage. During the persecution of the Church in Mexico in the 1920s, she came here as a refugee and she was welcomed by Bishop Cantwell. Mother Luisita used to tell people: “Let everything be for God.” ¡Que todo sea para Dios! I want to make her words my own as I begin my ministry. I pray that everything I do will be for God. Let us all make a new beginning today. Let us all re-dedicate our lives to doing the will of our heavenly Father in all things. ¡Que todo sea para Dios! Let us love in the little things, in all the daily routines of our lives! Let us be saints that no one may ever know about —except the people who are close to us, the people we live with and work with. By our prayers, teaching and good example let us bring many people to know Jesus. I’m humbled that the first bishop here, Francisco Garcia Diego y Moreno, came to this country from Mexico, as I have. I ask his prayers for my ministry. I ask the prayers of Blessed Junipero Serra and all the saints of the California Missions. I ask the prayers of St. Rafael Guizar Valencia, the heroic bishop of the poor, from Veracruz-Jalapa. Finally, I ask the prayers of St. Joseph, my name saint, and my model for my life as a Christian. I have entrusted my ministry to Our Lady of Guadalupe. And I ask her prayers today for all of us. May this Church, this family that our Father has gathered here in Los Angeles, always be a sign that God is near, that in his loving eyes we are all his children, and that no one is a stranger to any of us! Amen.